Spending a year in a city hall somewhere, dragging a dusty bureaucracy into the 21st century one line of computer code at a time, might not sound like a good time to most. Believe it or not, though, 550 people are competing for just 26 spots on a fellowship to do exactly that — evidence for some that writing computer code in an effort to improve civic life, called civic hacking, can be called a movement. Code for America, the program to put teams of coders in city halls to help solve problems through software, will this week select the finalists for its second class of fellows. In a blog post yesterday, CfA chief geek Dan Melton writes that the 26 fellows for 2012 will be selected from a pool of 550 applicants from around the world. For me, some of the biggest examples of disconnect and potential opportunity come out of app contests or hackathons. Policy makers/political leaders champion city or social contests, to which, developers respond with dozens or even hundreds of submissions. So far so good. When the app contest is over, often too is the partnership. Maybe one or two apps will be adopted by the sponsoring entity; sometimes none. It’s very very rare that we see widespread replication or scaling of these efforts and applications across our movement. We could have an app contest in every one of 360ish metro regions, and not a single widely spread app as a result. 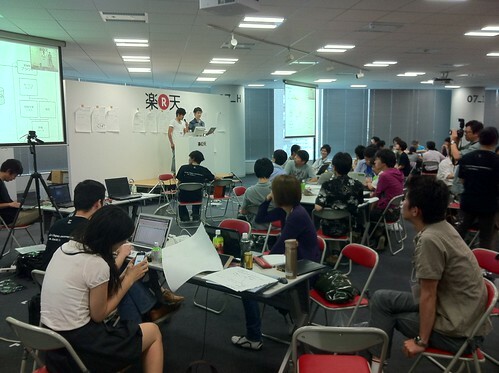 In fact, in the past year, I’ve counted nearly 80 hackathons, contests and other types of events in our space. At an average of 40 participants and say 10 hours (low), that’s 32,000 hours of cognitive surplus spent on software. This isn’t a problem of effort, excitement, time or energy. It’s a problem of scale, leveraging each other’s work and replication. We make once, but we’re not very good at making many times. We don’t lack from makers, just in our organization, 550 this year wanted to commit a year of their life to making. I’m excited about the opportunities for replication and scaling through CityCamp, Civic Commons, Code for America, Open Plans and Sunlight Labs amongst others. Maybe it’s the engineer in me, but we’re really lacking tools for widespread engagement, coordination and replication. That precise complaint — the wasted effort during hackathons — is a common refrain among civic hackers. There are solutions. Philadelphia developer Mark Headd of Tropo tells me that the website where Philly hackers present an API for access to their city's open data, PHL API, now grows after each local hackathon as coders pass along the data that they cleaned and prepped for weekend projects. The result is a steadily increasing pile of clean data — and less duplicated effort. PHL API, as a sidenote, is a port of Code for America Fellow Max Ogden's PDX API, built for Portland. With each hackathon, some of the detritus — bits of code, training videos, documentation, the right people trading email addresses — becomes scaffolding for the attendees of later ones. The case has also been made that developers often try idea after idea until they come up with one that will stick, whether that's in civic hacking or launching startups. But Melton's point — perhaps for the benefit of people inside government who are hoping to make hackathons a successful an recurring part of interaction between city halls and civic hackers, especially the hundreds of Code for America applicants who have energy and desire but won't be able to express it through CfA — is that in order for those great ideas to emerge, hackathons must be the beginning of a partnership, not the end.